This unit replaces the YT-450 auto tuner. Yaesu radios are among the best, and LDG makes several dedicated tuner for several models, but that leaves a big chunk of the newer Yaesu product line with no dedicated tuner. Of course, most LDG tuners will work just fine with Yaesu radios, but it sure would be nice to have it integrated to the radio. LDG's new YT-1200 is just that. An included CAT/Power cable interfaces with your FT-450(D), FT-950, FT-DX1200 and FT-DX3000. This makes it an integrated tuner powered by the interface. No extra power cables are needed. Just press the tune button on the tuner and everything else happens automatically! The mode is set to carrier and the RF power is reduced, a tune cycle runs and the radio is returned to the original settings. It's the perfect companion for your FT-450, FT-450D, FT-950, FT-DX1200 or FT-DX3000 Yaesu radio. Order yours today! If you have any questions about which LDG tuner to purchase, take a look here! RF Power: 1 to 100 watts SSB and CW, 30W on PSK. Built-in CAT/Power interface for FT-450(D), FT-950, FT-DX1200, FT-DX3000 radios. Also interfaces with FT-2000 (non-D) with external DC power supply. CAT thru port for computer control of radio. 38400 baud. 2000 memories sorted by frequency. 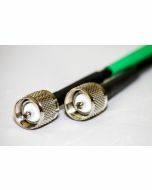 SO-239 in and out connections for dipoles, verticals, beams, G5RV, OCF, Cobra, ect. Includes 1.5 foot CAT/Power interface cable.